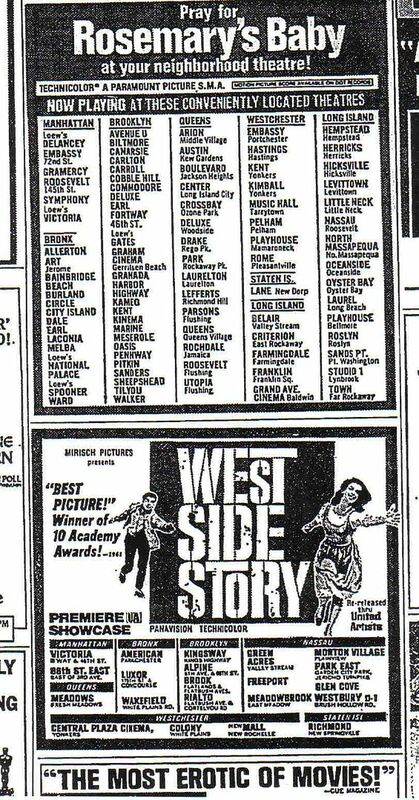 Check out this ad for “Rosemary’s Baby”, it shows the Pitkin was open as late as 1968. Can you believe it’s playing in 29 theatres just in Brooklyn? Are there even 29 screens among the plexes in Brooklyn anymore? Thanks for your answer, Sylvia, and thank you, alkan, for YOUR post. The closest thing Ridgewood had to the Kishke King was the hot dog and knish stand at the “depot” : Myrtle Wyckoff and Palmetto, intersection of M and L subways, and start of the B26, B38, B52, B54, Q55, and Q58 bus lines. A bit fancier was Gottlieb’s Jewish Deli Restaurant on the north side of Myrtle, just to the east of the depot, between Palmetto and Woodbine. I grew up in Ridgewood on Jewish deli food, among other kinds of food. Did you ever go to Knish Nosh on Queens Blvd. in Forest Hills, near the 67th Avenue subway station ? Spring and summer 1968 my mother went to a doctor on East 98th St. near the Rutland Road IRT el station, between, I believe, Clarkson and Winthrop, so I got to know that area, on the cusp between Brownsville and East Flatbush, a bit. I think there was a small Jewish deli restaurant there that had all kinds of knishes, kasha and groats and maybe spinach, as well as potato, the round kind with a burned-looking crust, like the ones at Canarsie Pier, as opposed to Gabila’s knishes, “King Of Potato Pies”, which were more common, and looked like golden-brown square pillows with sharp corners. Reading these most recent posts, I feel a little bit young. At the age of 57, this is definitely not the way I feel all of the time. As I said earlier, I live in Crown Heights, so I am still close enough to have passed by the Pitkin many times in recent years. I went to movies mostly at the Pitkin and the Sutter. At the Pitkin, I distinctly remember seeing Teahouse of the August Moon and Around the World in Eighty Days. Iâ€™m sure I saw many others, but perhaps they remain in my mind because they were both fairly â€œadultâ€ films and I was still quite young at the time they played there. Like you, Sylvia and Beverly, I also remember those clouds and stars in the Pitkinâ€™s ceiling. Outside the theatre, I definitely remember the store selling coconut milk. I remember begging my mother many times to let me buy some. When she eventually gave in, I remember thinking how terrible it tasted and wondering why I had wanted it in the first place. It must have had something to do with those carved coconut heads. I also remember the Brooklyn Womenâ€™s Hospital. I lived directly across the street from it at 1402 Eastern Parkway. The hospital began an expansion on the Eastern Parkway side sometime around 1957 -58. (Iâ€™m fairly sure of the date since this is when we moved out of the area.) Apparently because of changes in the neighborhood, this expansion halted in midstream. For many years, the iron expansion skeleton stood there looking quite forlorn. I gather that the hospital closed years ago, but I donâ€™t know when. Just in the past year, however, the skeleton was removed and the hospital was rehabbed into apartments with its entrance on the Lincoln Place side. Itâ€™s too bad they did not make a nice entrance on the Eastern Parkway side. I got to the subway but unable to access the images yet — will work on it. Schildt in this case is Dutch — my late husband was from Holland — it can mean a picture or a shield in the medieval sense of a coat of arms or it can mean a sign. I saw your allusion to Hoffman’s — there was a sit-down restaurant and a very popular cafeteria — eating out was not in the family budget, so I think I only ate there once or twice. But of course I passed in front of it thousands of times – there were always people (mainly men) milling in front of it with toothpicks in their mouths. It was a kind of social hangout. And if memory doesn’t fail me, there was an upstairs, which occasionally served as a shul for the High Holy Days. The vaudeville show, when offered, and the movie line-up were included in the price of admission. Saturday afternoon was mostly Loew’s Pitkin Day for kids in the neighborhood, unless we were really turned off by the main attraction. The line-up was normally a main top run movie, followed by a B-movie. There were also serials which we called the “chapters” like “The Perils of Pauline” which featured cliffhanger installments, typically 12, one each weekend. There were the cartoons, specially selected short subjects, travbelogues, and of course the Paramount News. We would show up when the lineup started – around noon – I carried a bag of sandwiches and fruits – along with money for drinks and candy TO SHARE (nonpareils were a favorite) and I doled the food out in bits all through Saturday afternoon. All of this would end about 5- 5:30 when they through the kids out. We sat, all 5 of us, in a special children’s section monitored by a matron and usher. If we wanted to see the main feature over again, we would split up and sneak one by one over to the adults section and glom onto a grown-up, who would agree to say we were with him or her. That way, we could finish by 6:30 or 7, just in time for supper. A great day for 25 cents apiece minus treats. Kishke King was a place – a deli on Rockaway and Pitkin that sold kishke and knishes (Jewish style – no pork) and foot-long hot dogs. You took your purchases home or ate them in the street — long before fast food. My Kishke King story is about their long-standing promise to give out free foot-long hot dogs if the Dodgers ever won the World Series and I was there the day they made good their promise —a mob scene!!! The lines wound several times around the block. Sylvia, I too remember that beautiful Pitkin ceiling with stars and drifting clouds. A memorable highlight for me from those early years (I was born 1923) was when Henrietta Cameron came for lunch at my Dad’s restaurant (“Hoffman’s”) a block away from the Pitkin. I couldn’t have been more thrilled if she were the Queen of England ! Thanks for your answers, Sylvia. Who was the Kishke King ? Did you ever hear of “the prince of Pitkin Avenue” ? Half my ancestry is Polish, so I grew up thinking that kishka was pig’s blood and rice inside a sausage casing. Ugh ! My small “Oy vey – it’s Yiddish !” glossary says that “kishkes” means guts, or intestines. I am VERY MUCH enjoying your trip down memory lane ! If you go to www.nycsubway.org, Station By Station, IRT Brooklyn Line, Saratoga Avenue, you will see the brown brick hulk of the Ambassador in about ten images of that el station. My Uncle Joe, the younger of my two uncles, was born November 9, 1934. My dad, who grew up in Bushwick, recalls Murder Inc. as active also in the Bway Junction – East NY area. My wife and I just watched “The Bishop’s Wife”, with Cary Grant, Loretta Young, and David Niven, last weekend. One of our Christmas movies. What does your last name mean ? I should know, because I’m half German, but I don’t. I ask, because I’ve seen ads for a Schildtwachter Fuel Oil Company. Would love those photos – might even inspire me to write a sequel — the book contains what photos I could muster including a picture of the Kishke King. I was born in 1934 at the Brooklyn Women’s Hospital – am the eldest of 5 kids (all still living thank God) – went to PS 175, JHS 84 (my brothers went to JHS 66) then Jeff. Although my sister was able to go to 156, Arthur Summers JHS and then Tilden (the traitor!!). The book is technically out of print — but the main library at Grand Army Plaza bought a copy when it first came out. I was very proud of that. It was a little like coming home. I remember one movie I saw at the Ambassador — with Ingrid Bergman and Cary Grant – I think it was called “Indiscreet” – a lighthearted farce. Glad you are enjoying my trip down memory lane. Thank you, Sylvia. Mayn own shtetele ist Bushwick und Ridgewood (Ritchvoot). I am a youth of 50. Where can I find your collection of stories, “Remembering Brownsville” ? Perhaps “Bway” on this site could get a current picture of 38 Herzl St. for you. My condolences on your physical handicap(s). May I ask what year you were born ? I ask so I will know where you stand re : my generation and my father’s (he was born in 1919). Around 1940 or so my dad dated a gal named Anne Scherbach who lived on Pitkin near Pennsylvania. They went to Loew’s Pitkin once. We must all be nuts — waxing so nostalgic over a movie theater. But I guess it was such a rich experience, so different from our everyday poverty. Yet, we did have stuff I don’t think inner city communities have today and in abundance – we had the Pitkin, and the other ancillary movies, within walking distance. Each was a window on something better than we had and that I suppose fed optimism. Also, we had an olympic sized outdoor pool at Betsy Head, lush playgrounds at Lincoln Terrance Park, and a rich stream of fascinating retail shops (mostly beyond our means) all along the Avenue. Then there was the HES on Hopkinson. Weddings at various catering halls which meant free live wedding music (klezmer/pop) streaming from their windows in summer. The Stone Avenue Library just for kids. And for a pittance you could catch the bus or IRT and see all of Manhattan, the Bronx, and of course Prospect Park, Ebbetts Field, Coney Island, Brighton Beach. We never lacked for amusement, much of it free, did we? I was born and raised in Brownsville. First at 38 Herzl Street (corner Pitkin, just 3 blocks away – and then when I was 17 we moved to Legion Street at Dumont (above the pool hall) also 3 blocks from the Pitkin. It was the place I got my news as well as culture growing up. Ah, memories – I wrote about it in my collection of stories “Remembering Brownsville/Mayn Shtetele Bronsvil”. When you look at the grandeur in full detail and remember the crowded conditions in which we lived (in my case 7 people in 3 very tiny rooms), it’s amazing. If you do get over to the Ptikin, could you snap a shot of 38 Herzl Street which is now the New Cibao Grocery? I live in Baltimore these days and am physically handicapped so even a trip is pretty problematic. Sylvia Schildt, thank you for all this wonderful information ! What was your past experience of Loew’s Ambassador Theater at Saratoga and Livonia Avenues, or have you already commented on that theater’s page, on this site ? Lastly, do you know a gentleman named Saul Zaveler from your former neighborhood of Brownsville ? That would be a great contribution to this site, alkan. Hope you make out. Maybe I should look up the current ownership of this building in the Brooklyn Hall of Records? Perhaps the current owner would allow me to enter the unused area with a camera? Since I currently live in Crown Hts, I’m not all that far away and I’ve passed by the theater many times on my bike. It always reminds me of the days when I lived not 2 blocks away (from 1949 to 1957). I would love to see what it looks like now. I wonder if there is anything left? And as I stare further, isn’t that niche in the front where the organ stood??? It used to magically come up from below and then descend and there used to be a sign “Henrietta at the Organ” if memory serves me. Now all that’s missing to share with my kid is the grand staircase and lobby. Or maybe the ladies lounge outer area. Got them and thanks. But are you sure these are the Pitkin interiors ??? I remember a darker ambience with stars and floating clouds — of course it’s been over 5 decades since I was last there. And these are fully lit sans atmospherics. I get exteriors at this post, not interiors — got another date? Can you e-mail me a photo at ? Also interested in pitures of Loew’s Pitkin ephemera – such as announcements, ads, beauty contest materials, etc. This is an amazing theatre from the outside, too. When I drive by I can only stare in wonder. The Loew’s Palace was located on Strauss Street cnorner East New York Avenue amd usually showed movies a week or so after the Loew’s Pitkin at a lower ticket price. It was less fancy and had a very tough dyed blonde matron named Sally, who kept a tight reign on neighborhood kids. The Hopkinson on Hopkinson Avenue, between Pitkin and Sutter Avenues, did become a movie house, and after WWII specialized in foreign films including Russian, German, Italian and French (re-runs of pre-war classics, as well as showing those films that were in vogue at the artsy-fartsy NY art cinemas. The Stadium on Chester – off Pitkin and Sutter – showed lots of B pictures — Charlie Chans and the like. The Sutter, near the IRT Sutter Ave. Rutland Rd. elevated, also showed lots of B pictures. They all featured special kiddie line-ups for Saturday afternoon. The fun for a kid was to somehow be able to stay for at least an hour or two after they “kicked the kids out” at 5 or 5:30. It was a challenge. One trick was to change your seat around 4 oclock and line up with an adult in the adult section and get them to say you were with them. That way you got to see the main feature one more time for free and killed time until dinner was ready at home. Does anyone have any pictures of the Loew’s Pitkin Interior??? The Loew’s Pitkin organ was a junior version of the larger Robert Morton organs found in Loew’s Jersey, Paradise, 175th Street, Valencia, and Kings. These “Wonder Mortons” were all 4 manual 23 rank jobs with large scales and heavy pressures. The Loew’s Pitkin Morton was 3 manuals and 14 ranks. I have no idea what became of the organ, but I suspect it was broken up for parts. A similar Morton organ was installed in Loew’s Fairmont. Loew’s 175th Street: Intact but unplayable, as far as I know. Loew’s Kings: Broken up for parts. Organ was to have been installed in Town Hall NYC by ATOS, but, some mess took place and the organ broke up. Loew’s Kings console is in a private home in Wheaton, IL. Console now plays the Morton organ from Loew’s Fairmont. Loew’s Paradise: Organ is to be reinstalled into Loew’s Jersey, Jersey City. Am wondering why Cinema Treasures does not list the “poor man’s Loew’s Pitkin” which was the Loew’s Palace located around the corner from the Pitkin.